Here's the official release from Marvel: "Before he flays the metal off of Tony Stark's hide in 'Iron Man 2,' this is every True Believer's chance to crawl inside the twisted head of the wicked Whiplash," boasts Editor Bill Rosemann. 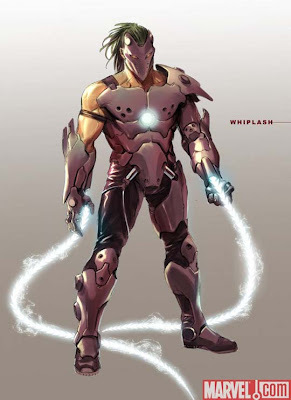 "If it's jet-setting, globe-trotting, eye-popping action you crave, IRON MAN VS. WHIPLASH will make you believe that Tony Stark is indeed a cool exec with a heart of steel...and Whiplash is the fiend that will break it!" 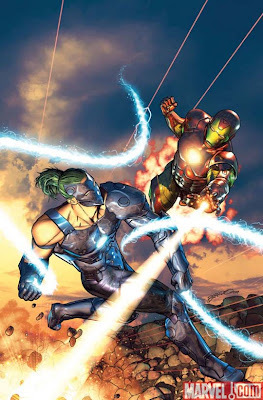 The comics are written by Brannon Bragga & Marc Guggenheim and penciled by Phil Briones. The first of 4 issues hits comic shelves November 4th!